What happens when you walk down the street and you see a friend. You might wave, stop and talk to them, before continuing to walk to your destination. All of those actions are controlled by you, by your brain. You told your brain to put one foot in front of the other to walk. Your brain recognized your friend and you told your hand to wave. You told yourself to stop, and to talk, and you told your legs to start moving again after you said goodbye. You decided if you walked, stopped, waved, spoke. There are other functions in our body, however, that we cannot control – functions such as our heart rate, whether or not we sweat, our blood pressure etc. These functions are controlled involuntarily by our nervous system and they operate largely in response to our environment. There was a time when it was believed that these involuntary functions were entirely uncontrollable. However with new technology comes new treatments. Biofeedback therapy (also known as neurofeedback and neurotherapy) is one such treatment and it can be used to treat a whole host of conditions such as migraines, anxiety, ADHD/ADD and much more. The systems that govern the human brain are the most complex and compact on earth, and they can be controlled through biofeedback therapy in such a way that you can gain more control over these previously involuntary functions. Biofeedback history and brain self-regulation goes as far back as 5,000 years – to the beginnings of meditation and various yoga techniques – however, the word “biofeedback” wasn’t coined until 1969. It can be said that biofeedback history began with the research of Edmund Jacobson who developed progressive relaxation technique in the 1930’s. Check out this post for a more detailed history of biofeedback therapy. Biofeedback therapy has now developed into a clinic-based practice that can also be conducted in the patient’s own home with access to the right equipment. Further, biofeedback is a treatment option that has been endorsed as a Level 1 treatment for children with ADHD by the American Pediatric Academy. At the initial session in the clinic, sensors are attached to 19 specific sites on your head via a “swim cap” in order to painlessly track your brain wave activity. 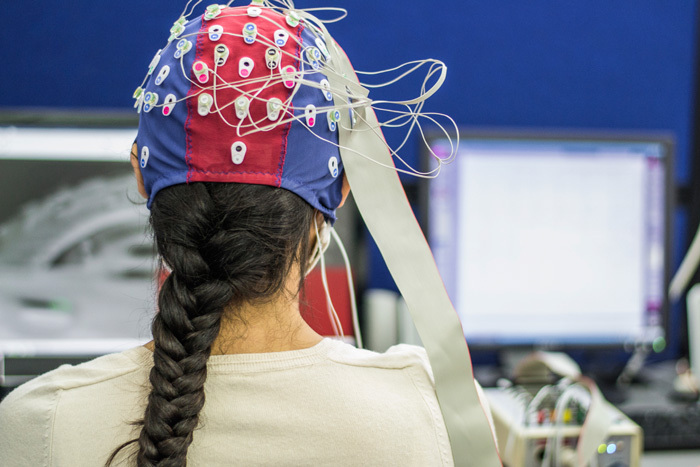 From these sensors, a QEEG brain map is created. Doctors analyze the QEEG brain map and gather information about why you may be experiencing your symptoms based on what is happening in your brain. For example, your condition might be as a result of states of neurophysiological over-arousal or under-arousal. These readings become the benchmark for what is happening in your brain now. Biofeedback therapy aims to change what is happening in your brain now to a more desired state that does not result in the symptoms you are experiencing. The specific brain map of your current state is used to determine the biofeedback therapy that you will undertake. Put simply, a biofeedback therapy session involves placing sensors on your head, like in the initial session, but this time in the specific spots that have been identified as being responsible for the unwanted symptoms. In some clinics, the biofeedback therapy sessions take place at the clinic each time, however, at St Louis Neurotherapy Institute we provide you with the equipment so you can conduct the training from the comfort of your own home. Your biofeedback therapist will show you how to practice exercises to control your brain waves. For example, you might use a relaxation technique to turn down the brainwaves that activate when you have a headache. As you change your brainwaves in response to the negative symptom, you get instant feedback in the form of a stimulant – the stimulant is your way of knowing that you are maintaining the brain waves in the desired state. This might be a monitor which displays a sound, flash of light, or image. You can see the negative responses as they happen on the monitor, and then get immediate feedback as you try to stop them. We like to use a video that fades so that it cannot be seen if the brainwaves are not kept at the desired state defined by the neurotherapist. This is particularly effective in the treatment of children. You know if you’re doing it right if the video image is clear – you’re training your brain to operate more efficiently through self-regulation! Ongoing training of the brain in this way reinforces the positive shifts in brainwave activity time and time again, creating new, permanent, neuropathways. Eventually, you’ll learn how to control these functions on your own, without the biofeedback equipment. Patients conduct in home biofeedback therapy training with the equipment proved by St. Louis Neurotherapy Institute 4-5 times per week. It takes approximately 40 minutes to conduct the training for best results. Usually, you can start to see biofeedback benefits within 10 sessions or less. Electromyography (EMG) measures muscle tension. Respiratory biofeedback monitors your breathing patterns and respiration rate. Electrodermograph (EDG) measure the activity of your sweat glands and the amount of perspiration on your skin, alerting you to anxiety. What can biofeedback therapy be used to treat? Many different health care providers offer biofeedback therapy, including psychiatrists, psychologists, and general physicians. As our name suggests, St Louis Neurotherapy specializes in this form of treatment. Founder Dr. Rhodes is certified in Neurological Dysregulation and Neurofeedback from the University of Bridgeport. See how biofeedback can help you or your child, and request a free consultation!